Because they capture the energy of the sun, solar kilns are becoming increasingly popular for the hobbyist or professional woodworker who wants to dry his own lumber, and with good reason; dried wood sold at a lumberyard is expensive. Greenwood, on the other hand, costs much less. However, air-drying lumber can take several months and can lead to warping and cracking before it can be used. Drying wood in a controlled environment requires much less time and allows the wood to contract without warping. Solar-drying kilns are the simplest, cheapest, and safest way to dry green wood quickly, and they are good for the environment since they don’t generate CO² emissions. A solar kiln will dry the wood with a smaller chance of defects than air drying. A solar kiln can also dry wood of varying shapes, sizes, or mixed species and thicknesses in the same load. After the kiln is loaded, only minimal vent adjustment is needed while the wood dries. Dr. Wengert developed a popular and simple solar kiln design in 1978. It is often referred to as the Virginia Tech Solar Kiln because Dr. Wengert developed it while working at Virginia Tech. Although there are different solar designs on the market today, the Virginia Tech design is the kiln model considered the standard by which other kilns are built. Woodworkers can find instructions for this model and other similar designs online. The initial investment for a solar kiln varies, depending on the size and the building materials. However, it pays for itself in the long run. A small solar kiln normally dries anywhere from 800-1,000 board feet, although some can be downsized to dry only a few hundred board feet. A large solar kiln dries 1,500-2,000 or more board feet of lumber. The Virginia Tech solar kiln can hold up to 1,000 board feet of 1-inch thick lumber per load and dry it in about one month of moderately sunny weather in the mid-latitudes of the United States. The kiln heats when solar energy enters the clear glazing and is absorbed on the black painted interior surfaces. As air is heated in the collector space, one or more fans circulate it through the lumber, enabling it to absorb moisture from the lumber’s surface. When the evaporated moisture increases the relative humidity to where it gets too high in the chamber, it releases it through vents in the back of the kiln. To alter the size of a kiln, one needs to keep in mind an important ratio: For every 10 board feet of capacity, one square foot of solar panel or roof area is needed. If the kiln has too much solar panel area, one risks the wood drying too fast, causing the wood to check and split. However, if there’s not enough solar panel area, there’s the risk of never being able to dry the wood below 15% MC. In order to circulate air through the stack of wood, it’s necessary to install an electric fan. If a larger kiln is built, two or more fans will be needed for optimum airflow. Roof angle also is important. To figure the proper angle, one needs to determine the latitude of the kiln. The latitude number is used for the pitch of the kiln roof. For example, in Minnesota, the latitude is about 45 degrees north. In that case, the solar panel would be mounted at a 45-degree angle facing south. If used during the winter months, the angle should be increased by 10 degrees (in this case, to 55 degrees), since the angle of the sun changes from summer to winter. Solar drying time for lumber can vary. For instance, drying time in the summer takes less time than in the winter. Also, drying time for 2-inch lumber will take longer than 1-inch material. Woodworkers first learning to dry lumber, especially lumber thicker than one inch, should monitor MC daily to avoid drying too rapidly. It’s important to monitor drying speed by measuring the MC of the sample boards and comparing the daily rate of moisture loss with the “safe rate” for that species. There are tables available that list the safe rates for drying 1- or 2-inch thick lumber from different species. The safe rate refers to the loss of moisture in one day. Safe rates must be followed until lumber MC drops to 20%. Although moisture meters don’t work well when the MC is above 30%, the design of the kiln is such that it normally won’t allow the wood to dry too fast. Still, when just learning to dry lumber in a solar kiln, it’s best to monitor the process to avoid any unforeseen problems. Exceeding the safe rate drying speed for a given species can cause defects in the lumber. If drying is too fast, part of the roof should be covered, or the fans turned off and the vents closed during the hottest part of the day. Although the temperature will likely rise inside the kiln, the trapped air will quickly reach 100% of its capacity to hold water and the lumber will stop drying. It’s also important to identify sample boards at the start to determine MC loss rate. These are boards that may have started out with a higher MC than the rest of the load were cut more recently than the others or are a little thicker. “So don’t pull the load based on the average. We usually pull the load based on the wettest pieces. The wettest has to be dry enough,” he adds. Dr. Wengert notes that the Virginia Tech solar kiln was designed so that it wouldn’t allow the wood to dry too fast. However, if the kiln is only half full and the lumber inside is prone to cracking, such as oak is, it would be necessary to cover half the collector on the roof. Otherwise, there would be too much solar input for the little amount of wood in the kiln. 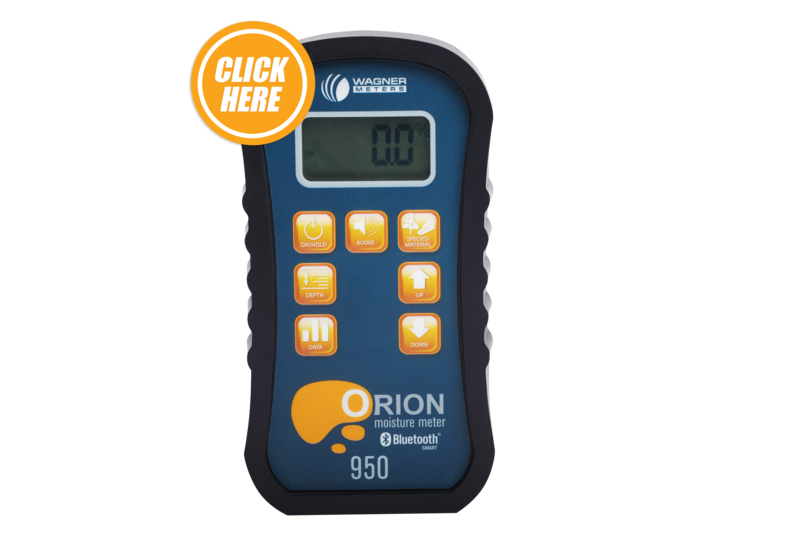 Moisture meters for kiln driers should meet all the specific needs you might encounter. A pin meter measures the MC of wood by running an electrical signal between the tips of two narrow metal probes that are inserted into the wood. The major disadvantages of pin meters are the relatively small area tested with each insertion, their sensitivity to wood temperature, and the damage the pins do to the wood surface. The pins can also break or give inaccurate readings when improperly inserted. Pinless meters use an electromagnetic signal to penetrate the wood surface. Their design lets users “scan” many board feet of wood simply and quickly. Because they don’t have pins, they do not damage the wood surface. They take readings at a fixed depth but do require sufficient pressure to give a correct reading. They may be susceptible to scratches or damage on the sensing pad as well. “The best meter, however, is one that’s used,” says Dr. Wengert. “If you’re drying wood and you’re going to make something of it, how much would you pay for insurance that it’s going to work right? Using a moisture meter will help you prevent it from cracking, warping, or splitting after you’ve made it. What’s that worth to you? Other than the initial investment, you only have to pay for the batteries,” he remarks. Wagner Meters, one of the leading manufacturers of American-made pinless moisture meters, says that “an accurate knowledge of the interaction between wood and moisture needs to be at the very foundation of each project a woodworker undertakes.” If not, every project is put at risk. Each professional Wagner moisture meter comes with IntelliSense™ technology, which allows accurate readings deep in the wood, unaffected by surface moisture. Wagner has meter models for woodworkers who need to measure wood moisture in all wood species–from the more common softwoods and hardwoods to rare tropical species. For most softwoods, Dr. Wengert says a 10% MC reading is optimum for indoor use. However, he would accept a reading of 10.5% or even 11%, but not higher than 11%. To go any drier than 10%, the lumber begins to machine poorly. It’s acceptable for softwoods to be slightly wet for indoor use. The amount of shrinkage that occurs is minimal, he says. In other words, the machining benefits outweigh the little bit of shrinkage. For hardwoods used indoors, the target MC is 7%, though a 6.5% or 7.5% reading is also acceptable. For outdoor use, both softwoods and hardwoods should be dried to about 12% MC. However, the MC will vary if the wood is going to be exposed to rain or an outdoor sprinkler, or if it’s going to be in a dry climate such as in Albuquerque, a wet climate such as in Seattle or a coastal region. In addition, if the wood is to be used for exterior house walls where it’s protected from rain, a good average is 12% MC. Solar kilns are ideal for the hobbyist or professional woodworker who wants to save money by drying his own lumber. 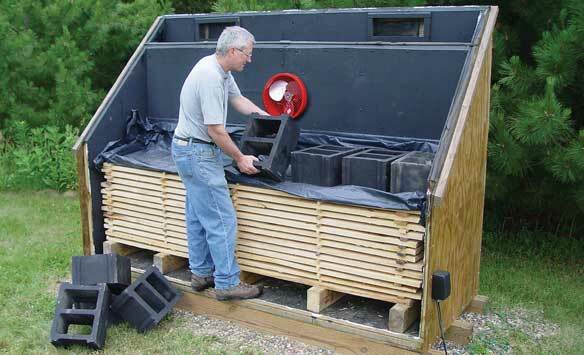 Solar kilns are relatively inexpensive to build and simple to operate. They use the free energy of the sun, so they cost nothing to operate except for the small cost of electricity needed to run the fans. Additionally, they are good for the environment since they generate zero CO² emissions. Although solar kilns are designed to keep the wood from drying too rapidly, it is wise to check the MC level, especially near the end of the drying cycle. It’s also recommended that woodworkers who are new to drying lumber in a solar kiln or who are drying wood thicker than one inch frequently check the moisture levels to prevent defects later on. 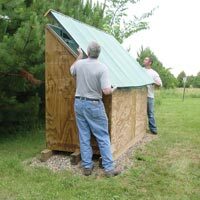 A moisture meter is a woodworker’s best insurance for solar-dried lumber to prevent cracking, warping, or splitting in the finished wood product. I’ve been trying to find the plans for the larger version of Virginia Techs kiln, but have had no luck. Any chance you could direct me to it? I am interested in building my own solar klin in Uganda (on the equator). Are there any implications beyond putting a roughly flat roof…? 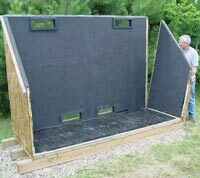 Here is a link to plans for a solar kiln. There are some very good tips on the design aspects and it also addresses the pitch of the roof in relation to your geographical location.